Rapidly soothes and benefits Acne-prone areas with Resveratrol, Vitamin C, Niacinamide, Provitamin B5, Chamomile, Aloe, and Shea Butter. Why is Resveratrol potentialy Better than Benzoyl Peroxide for targeting blemishes? It focuses on blemish-causing dirt and oil, and without the potential side effects of Benzoyl. Plus, Resveratrol is a world renowned anti oxidant with tremendous age defying benefits. So, the Dermagist Clarifying Cream targets the dirt and oil associated with blemishes, calms and soothes the skin, PLUS has tremendous age defying benefits. Resveratrol, Niacinamide, Stay-C, Provitamin B5, Aloe, Chamomile, Shea Butter and more! 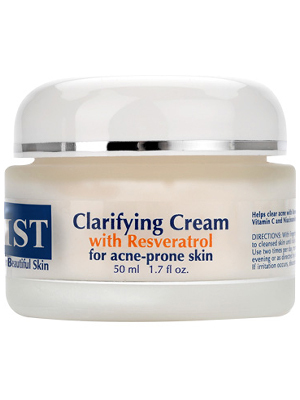 The primary ingredient that the Dermagist Clarifying Cream uses on blemish-causing factors is Resveratrol. In a groundbreaking study, Oxford University discovered that the natural ingredient, Resveratrol can target the same dirt and oil other common ingredients... but with NONE of the potential dangers. »Benzoyl Peroxide was linked to free radicals in the skin. That is the same cancer-linked effect of staying in the sun unprotected. »Benzoyl Peroxide (because of the free radicals) slows down the healing process of the skin. This means that while the dirt and oil might be gone, your skin's ability to calm redness and heal the sores is slowed way down, forcing you to endure more time with red, irritated skin. » Benzoyl Peroxide is known to over-dry skin, which leads to flaking and the increased chance that you will develop scars and discoloration. » Benzoyl Peroxide can increase irritation, making redness and bruising look worse, and last longer on the skin. Besides the revolutionary way of attacking the blemish-causing dirt and oil, how else does the Dermagist Clarifying Cream work to help acne-prone skin? Niacinimide and Sodium Ascorbyl Phosphate are vital ingredients in this cream, too. These are natural ingredients that quickly jumpstart the beneficial process of the skin. This means that your body is able to help prevent and attempt to lessen blemishes and redness of the skin. Stay-C, a Vitamin C treatment contained in the clarifying cream calms and soothes, PLUS targets the dirt and oil too. Calming and soothing blemish-prone skin is just as important as preventing blemishes in the firstplace. Most acne solutions on the market focus only on targeting the dirt and oil, leaving the user to endure continued discomfort of red, irritated skin that looks bad and can be painful. The Dermagist Clarifying Cream uses serious scientific ingredients to help your skin look better, faster. Resveratrol, which targets dirt and oil is also a TREMENDOUS antioxidant and aids in reducing redness. So, your skin is already one step ahead as far as redness and discoloration, simply from the cleaning aspect of the Resveratrol. Addtionally, Chamomile, Aloe Vera and Shea butter envelope the skin with their calming and soothing properties. These ingredients were carefully selected because they are capable of speeding the benefits of the skin, and calming down the redness of the blemishes, BUT MOST IMPORTANTLY, they accomplish this without clogging pores, or adding oil to the skin. This means that the soothing aspect of the solution does nothing to "undo" any of the benefits of the other blemish fighting ingredients in the treatment. Below are two TRUE SUCCESS stories you MUST READ! Martin W. from Dover, DE. I am sending this brief letter of thanks to let you know how well your product worked for me. I have suffered for a long time from really noticable acne on my face and my back. I took a picture of my forehead for you to see, but I couldn't take a picture of my back (laughing) At any rate, let me tell you how it worked for me. I bought the clarifying cream, as you know, when you first released some of it to your customers. My mother got it for me, since she had been on your list of customers, I guess for the eye gel you offer. At any rate, she gave me this cream to try out, and I was a bit embarrassed, but I took it. That first night, I used the cream on my whole face and even on the parts of my back that I could reach. I continued to use it for the following several weeks. Let me just say, that it worked well enough for me to actually sit down and write this email to you. And I never do things like that. Believe me, it says a lot. My skin is 100% smoother, and the BEST part is that blemishes are so much less noticeable. The redness is what made it such a nightmare for me, because it was SO visible, I felt like everyone was staring. Now the redness is almost gone. My skin looks like the skin of my friends that I used to envy so much. I can honestly say that I actually got a compliment on how good my skin looked from a girlfriend of mine. This was the first time I ever got a compliment like that, and I owe it to you, Dermagist. Thanks for offering us the chance to use this product. It really changed how my skin looks and my self esteem too. I am happier than ever, and really just thrilled with the success I had from your clarifying cream. I recommend it to everyone out there. Tyler H. from Boise, ID. I am one of the people who converted from a Benzoyl Peroxide treatment over to your product. I was using a really popular acne solution that contained benzoyl, and my skin improved for the first couple weeks. But then, things went horribly wrong, and my skin was actually redder and more irritated than ever. I was desperate, and my dermatologist told me to see if I could find an acne solution that didn't have benzoyl, and if possible that contained Resveratrol. You were the only one I could find, but boy am I glad I found you. It was like magic how the Dermagist Clarifying cream calmed my skin right down. It was as if it "undid" the damage that the benzoyl product did to me. Then, it started to attack the blemishes that I had. Overall, I'd say it was about 3 weeks until I really started to see the fact that not only was my skin a nice calm color, but also that the blemishes and red parts were practically gone. The first two weeks, however, I think your product was just busy calming down the irritation I had from the benzoyl. I have since started telling everyone I know who uses other solutions to switch to Dermagist. They have all had good experiences, just like me. My face looks so much better, I still can't believe it's me, when I look in the mirror each day. Dermagist is the final chapter in my long book called "how I suffered through acne". It is also the final chapter, as I will never use another product again. The clarifying cream I got from you is just now finishing up after about a month and half. I will be getting more soon, and I just wanted to share my story. Thanks for listening, and if you want to call me or use this story on your site, it would be my pleasure to let you. Product : Dermagist / Dermajuv Clarifying Cream for Acne-prone Skin. All Items are new set, and original imported from USA.